The great helm or heaume, also called pot helm, bucket helm and barrel helm, is a helmet of the High Middle Ages arose in the late twelfth century in the context of the crusades and remained in use until the fourteenth century. They were used by knights and heavy infantry in most European armies between about 1220 to 1540 AD. 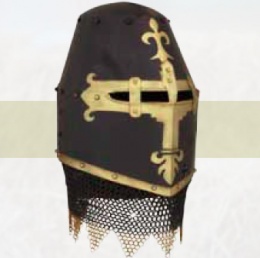 This darkened steel great helmet features brass riveted overlay ornamentation, horizontal eye slits nasal guard, and dagged chain mail neck protection. This page was last modified on 21 May 2014, at 19:38.